This week we’re pleased to bring you another of Timothy’s lesser-seen films in its entirety. 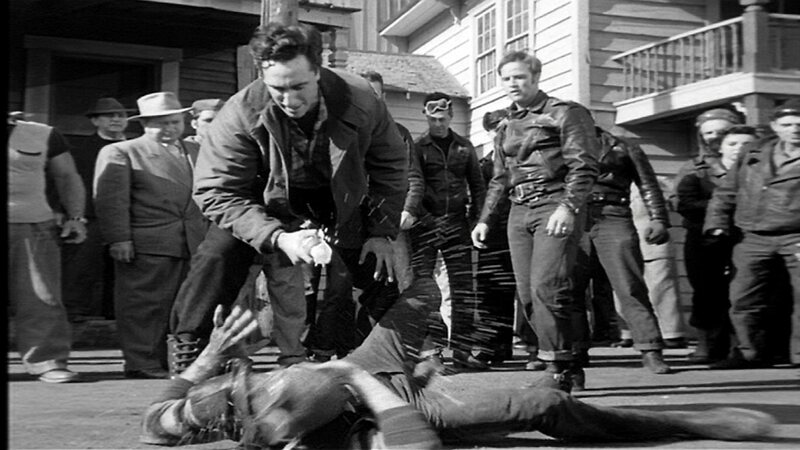 It’s the “teenage On the Waterfront,” Rumble on the Docks (1956), directed by Fred F. Sears. Tim has one of his best supporting roles as Frank Mangus, lackadaisical torpedo to waterfront boss Joe Brindo (Michael Granger). Plus James Darren, Robert Blake, Dan Terranova, and Freddie Bell and His Bellboys! Let’s get ready to rumble! It is ironic that a man, whose name is so widely unrecognized, could make such an impression on so many people. 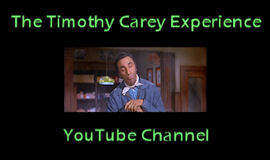 You don’t forget Timothy Carey. The infancy of Carey’s career consisted of small roles, often playing “the heavy” or a sideline thug. Yet, Carey’s presence could not be overlooked. Carey’s film career started small and didn’t really get to grow much more as time went on. His first film role came in 1951, with an uncredited role in Billy Wilder’s noir film The Big Carnival [Marisa’s note: AKA Ace in the Hole. Timothy may have been edited out of the finished film, however.] From there he played another small, uncredited part in the William A. Wellman‘s rustic western Across the Wide Missouri. After working in some forgettable films and playing small, miniscule parts, Carey got his first chance to really shine. In André De Toth’s gritty noir drama, Crime Wave (1954), Carey’s appearance comes late in the film where he oozes malevolence as Johnny Haslett. He then spends a good deal of time off-camera babysitting the protagonist’s wife. A testament to Carey’s creepiness on screen, the brief glimpse of him as Haslett is enough to keep audiences on the edge of their seats. Moving up from the number four thug to the crime boss’s right-hand man, Carey played Lou Terpe in Harold D. Schuster’s Finger Man (1955). Faithful to a fault, Carey makes the most of his small role, seething with pent-up penitentiary anger at the film’s wimpy hero. Between his work in Crime Wave and Finger Man, Carey had a small part in the Marlon Brando vehicle, The Wild One. Carey was uncredited in the film, but even with the limited screen time and lack of respect he was given, he managed to turn in the most memorable performance in the film. With his spraying of the soda pop into Marlon Brando’s face, Carey carved his imprint into the minds of many, making his miniscule Chino Boy #1 credit much more than expected. 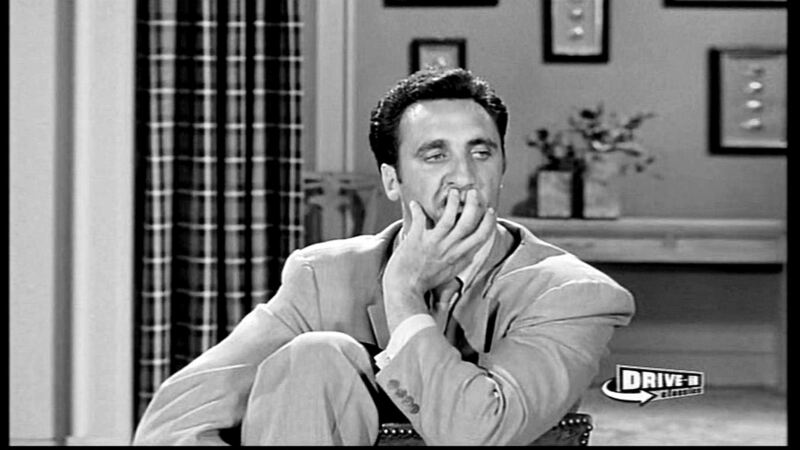 And from there, his small but loud presence in many films to come, like East of Eden, Rumble on the Docks, and Revolt in the Big House, created the enigmatically fascinating actor that one can only call Timothy Carey. D’OH! I was so busy yesterday I never got around to posting our regular Wednesday video. My apologies! So, to attempt to make up for my negligence, today you’re getting not one but two videos! Let’s start off with the one I should have posted last week but it hadn’t quite been put up on YouTube yet. It’s a clip from the newly released on DVD Revolt in the Big House (1958). Timothy is featured prominently, and it includes the great moment when he starts making out with his new machine gun. Our second video ties in with the first. It’s an interview with Robert Blake, from an appearance on the Tavis Smiley show from December of 2011. Blake talks briefly about the handful of films he made in that very studio in the late 1950s, including Revolt and Rumble on the Docks (1956), and mentions an amusing moment he shared with Timothy at about the 2 minute mark. I can’t seem to get the video to embed, so here’s the URL. All I can say is, I’m going to get my old Minnie Mouse watch fixed ASAP. To celebrate the long-awaited official commercial DVD release of Revolt in the Big House (1958), our pic today is another promotional still from that very film. 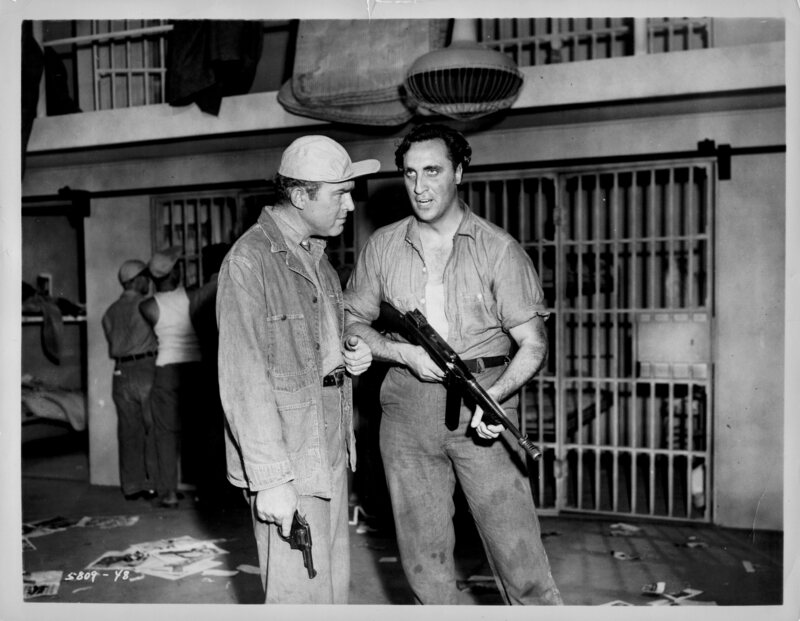 Lou Gannon (Gene Evans) and Bugsy Kyle confer during said revolt. The Warner Archive Collection is a great source for several of Timothy’s films on DVD, including Waterhole #3 (1967), Chain of Evidence (1957), The Outfit (1973), Rumble on the Docks (1956), Convicts 4 (1962), and now this one. Way to go, WAC! Our pic of the day takes another look at Fred F. Sears‘ Rumble on the Docks (1956), kind of a teenage On the Waterfront with a side of West Side Story thrown in for good measure. 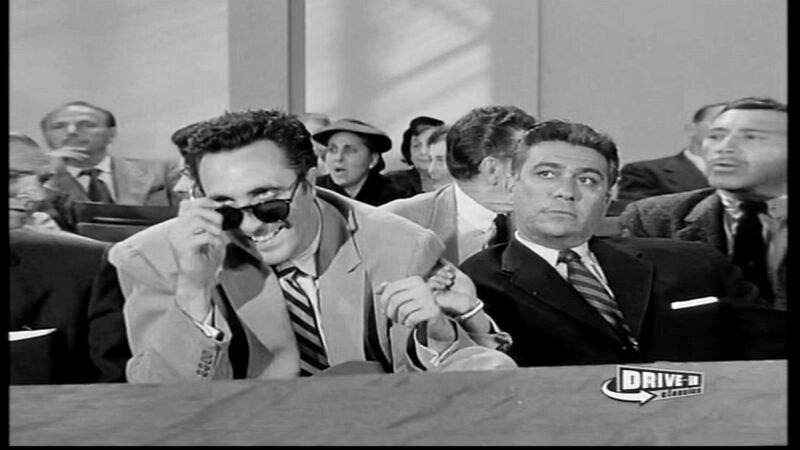 Racketeer Joe Brindo (Michael Granger) and his torpedo Frank Mangus are pleased with the outcome of a big court case. Granger had appeared with Timothy three years earlier in Henry Hathaway‘s White Witch Doctor (1953), both of them in don’t-blink-or-you’ll-miss-’em roles. 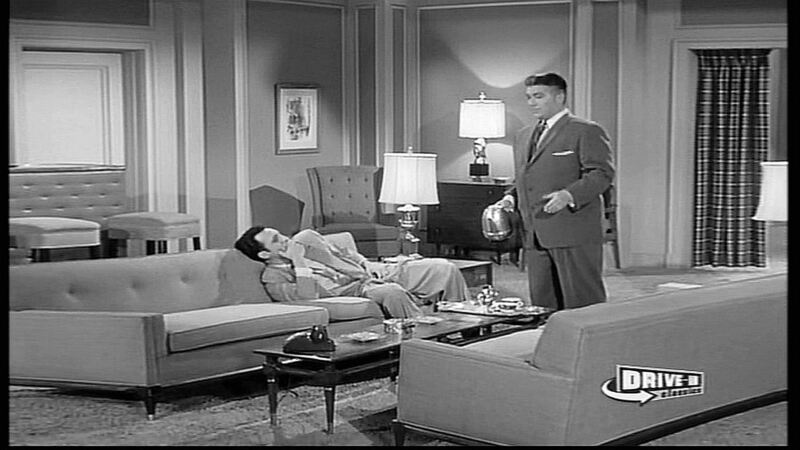 He became another dependable character actor in films and on television in the 1950s and early 1960s. In 1961 he made several TV appearances, then dropped out of sight until 1977, when he portrayed his final role in an episode of Kojak. What he was up to in that sixteen-year interval is a mystery. He died of a heart attack in 1981, at the age of 58. We close the week, and the first month of 2014, with another shot of Frank Mangus, the blasé torpedo of Rumble on the Docks (1956), directed by Fred F. Sears. This pic pretty much encapsulates my feelings after a trying and frustrating week. This neat little film has finally seen an official DVD release, so you won’t have to contend with the “Drive In Classics” logo any longer. Wishing you a great weekend and a better week ahead.